Automatically resizing grid columns to the longest content width. Sometimes we need to show the content of all the cells of grid without cutting them. For this purpose you can use auto-resize grid cells plugin. The plugin does not work with flexed columns, it just removes the flex property. 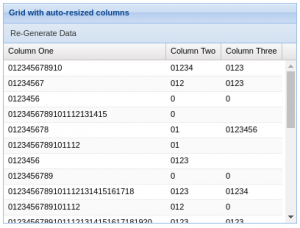 To keep the flex property you need to check if the column configured with flex and do not the ‘autoSize’ method.